At my recent trip to the grocery store I came upon piles of plums on sale. I love to take advantage of fresh fruit, in season. I considered making plum pie, but decided instead that I wanted to preserve some of this flavorful fruit for later in the year. 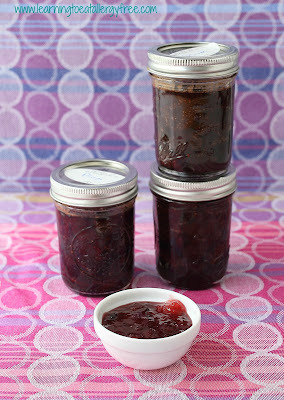 Plum jam was in my future, and it can be in yours too! This is a super-simple jam. Just three ingredients. No pectin. No preservatives, except sugar. 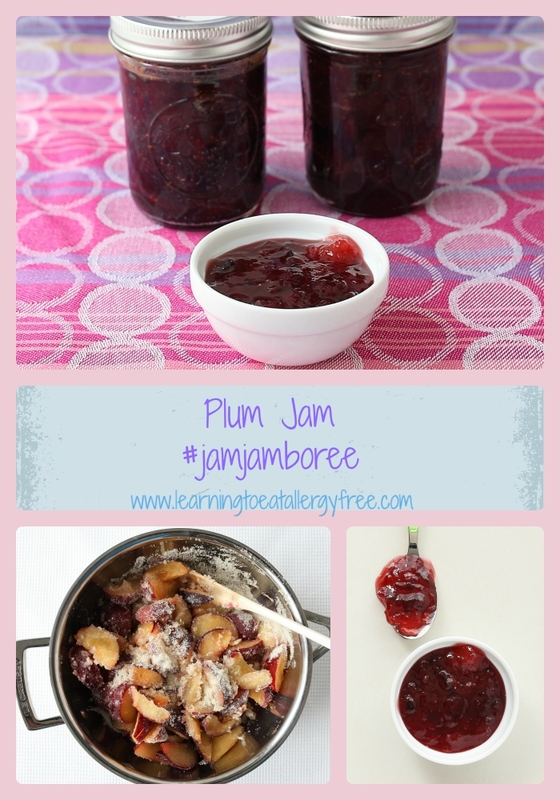 This can be made as refrigerator jam, or refer to The Allergy-Free Pantry or another reference to learn how to safely preserve jam. Wash the plums, slice them, and remove the seeds. Keep the skins on, for color. 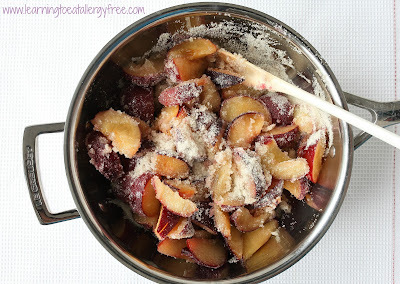 Combine the plums and sugar and let them sit for an hour until juicy. Add the lemon juice. Bring the mixture to a boil over medium high heat, stirring occasionally. Reduce the heat to medium and boil for 20 minutes until most of the skins have separated. At this point, skim off as many skins as you can find. Boil for another 10 minutes, stirring frequently, until thickened. I think this is my new favorite jam! I lived next door to you, I'd be banging on it nightly with wine glass in hand begging for treats. I would be a pure mess. This looks divine. I'm always in awe of your recipes and of course, your work! Plums will be amazing in just a few more weeks in these parts! Growing up, we had a distant relative who had a plum farm and our August fun was spending a week picking plumbs in the hot sun! Awesome post. Most informative. Thx. It’s a very useful post. thanks for the efforts. This is such a useful tool for writing. It helps me with my story writing. From reading this recipe, I think the reason people are having set problems is because, according to the folks at the Sure-Jel number, powdered pectin has to go in BEFORE the sugar, or you will get a set fail.